Keeping in mind the innovative strategies to keep the little viewers happy, POGO has partnered with an upcoming movie Hawaizaada to create a special TV presentation featuring actors Ayushmann Khurrana, Naman Jain and toons Chhota Bheem and Kiteretsu. The special titled ‘Bheem, Kiteretsu aur Hawaizaada’ will premiere on January 30 at 5:30PM only on POGO. Bheem, Kiteretsu aur Hawaizaada, the 70 minute special presentation will draw similarities between Ayushmann’s character in the film Shivkar Bapuji Talpade – an Indian who invented the flying machine (aeroplane), and Indian superhero Chhota Bheem and child prodigy and genius inventor Kiteretsu. 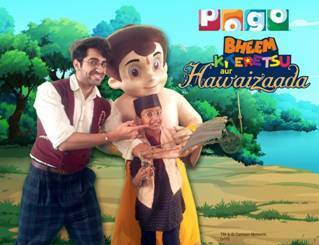 Bheem, Kiteretsu aur Hawaizaada is the fifth Bollywood partnership undertaken by POGO. In the past year, the channel has also partnered with Kick, Singham Returns, Bang Bang and Happy New Year.